Classical's Marthaline Cooper finished third in the women's hammer throw at the NCAA Division I National Track & Field Championships in Eugene, OR on Thursday. 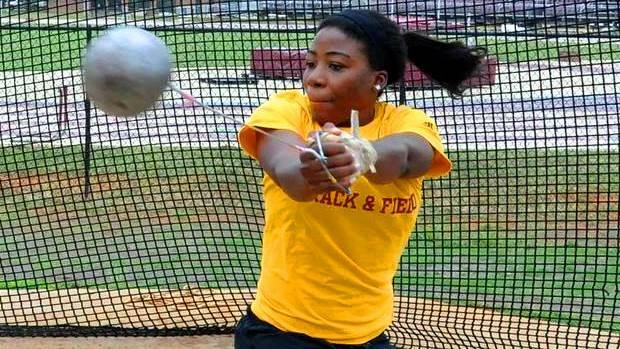 The Winthrop junior wasted no time establishing herself as one of the best throwers in the competition, uncorking a 213-11 on her first throw. Cooper was throwing third in the first flight and jumped into the lead with that toss. She stayed in first place until eventual winner and defending champion DeAnna Price of Southern Illinois threw 223-6 in the middle of the second flight. Price would add her winning toss of 234-8 on her final throw in preliminaries. Cooper threw 197-7 and 207-3 in her final two throws in the preliminaries and went into the nine-person final in second place. She was still in second going into final throws until Sara Savatovic of Kansas State unleashed a throw of 215-3, jumping from sixth to second. Cooper had one final chance to best the Kansas State senior but had a 203-4 on her final throw and had to settle for third. Cooper broke her own school record with the 213-11 throw and her third-place performance marks the highest finish for a Winthrop athlete in the NCAA Track and Field Championships, both indoor and outdoor, according to the school's website. Also yesterday, PC's Grianna Ilarda (Perth, Australia) advanced to the finals of the women's 3,000 meter steeplechase. Ilarda ran a 10:00.02, finishing sixth in her heat and advancing on time to the finals on Saturday. On Wednesday, Princeton freshman Adam Kelly (Barrington) finished 14th in the men's hammer. Kelly had throws of 213-1, 213-3 and 215-11. He earned a trip to Eugene by grabbing the final qualifying spot at the Eastern Regionals with a throw of 214-07. PC's Jordan Mann (St. Louis, Mo.) finished 15th in the semifinals of the men's 3,000 steeplechase on Wednesday with a time of 8:48.05. The top 12 finishers moved on to the finals. La Salle alum Dakota Dailey-Harris, a senior at Miami, will complete in the high jump and Brown's O'Sha Williams (Jamaica, NY) will complete in the triple jump Saturday afternoon.